To ramp up successful prosecutions of Wall Street wrongdoers, the U.S. Attorney General is proposing larger financial rewards for whistleblowers. In the past, the best a Wall Street whistleblower could hope for was the satisfaction of knowing that justice was served (in addition to reams of publicity). Yet if Attorney General Eric Holder has anything to say about it, producing evidence of white collar wrongdoings would also be a highly lucrative endeavor. According to the Wall Street Journal, the Attorney General, who fielded heavy criticism from both Democrats and Republicans for how his department handled pursuing charges related to the 2008 financial crisis, is planning on calling for a new law that will increase financial rewards to Wall Street whistleblowers. 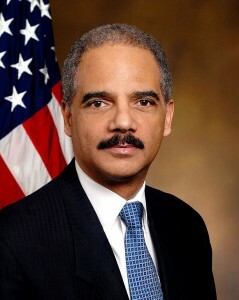 Holder will make his proposal known at a speech Wednesday at the New York University School of Law. Holder will invoke the 1989 Financial Institutions Reform Recovery and Enforcement Act, called FIRREA, which provides whistleblower rewards, to urge Congress to increase payments. Under FIRREA, whistleblower rewards are capped at $1.6 million. Although that sum could be deemed sizable, “in the world of big Wall Street bonuses and salaries,” it might not be considered a high enough figure to induce individuals to come forward with proof of nefarious white-collar deeds, says the WSJ. Holder is expected to “argue that the FIRREA whistleblower provision should more closely match the whistleblower provisions in the False Claims Act, a law that aims to sniff out fraud against the government by offering as much as 25% or 30% of the amount recovered,” according to the WSJ.